You are here: Home / All Posts / World’s Largest Comic Strip: One Weekend And Gone! World’s Largest Comic Strip: One Weekend And Gone! 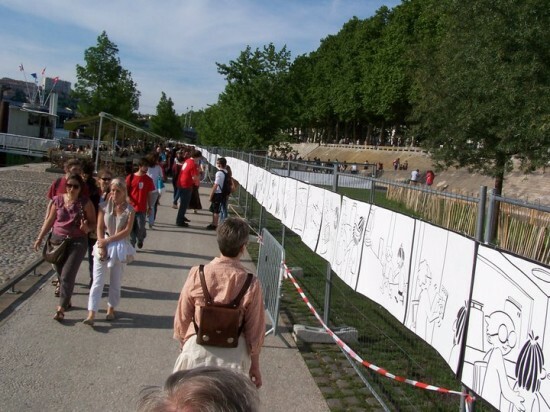 It took a team of 11 writers and 111 designers to make the world’s largest comic strip, stretching 1 kilometer along the banks of the Rhone River, in Lyon, France. The project went up on Friday night and was taken back down on Sunday. But every panel was scanned and will later be made available as a 100-page album. To see the full set of art work you can go to the projects website www.laplusgrandebddumonde.com. The black and white comic didn’t contain any words, but the script and graphics were simple and eloquent enough that everyone who saw it understood the story. It tells the tale of a shaggy Tarzan-like character, with a passion for drawing, who discovers the ways humanity has invented to represent itself (painting, sketching, etc.). 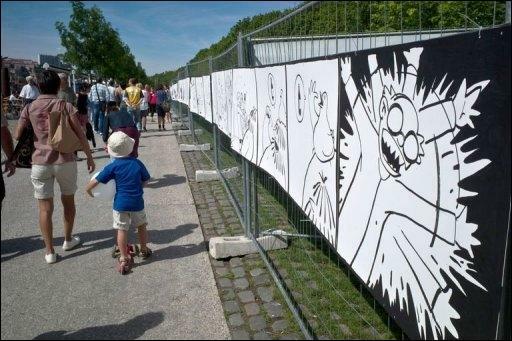 1,000 meter-long sheets of paper, weighing 800 kilograms, and 250 markers were used to create the 1-km-long comic strip. « First Featured Artist: Alison Kreitzberg!